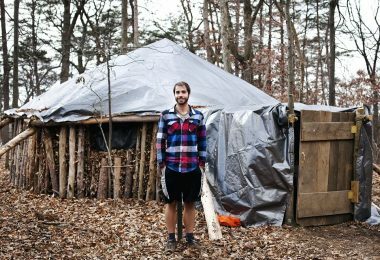 You have to agree that getting out in the wilderness can be a whole lot of fun, but if you’re not prepared, your fun can turn into something else entirely. After all, you know that you are out in the wild where anything can happen, and that includes bears, right? 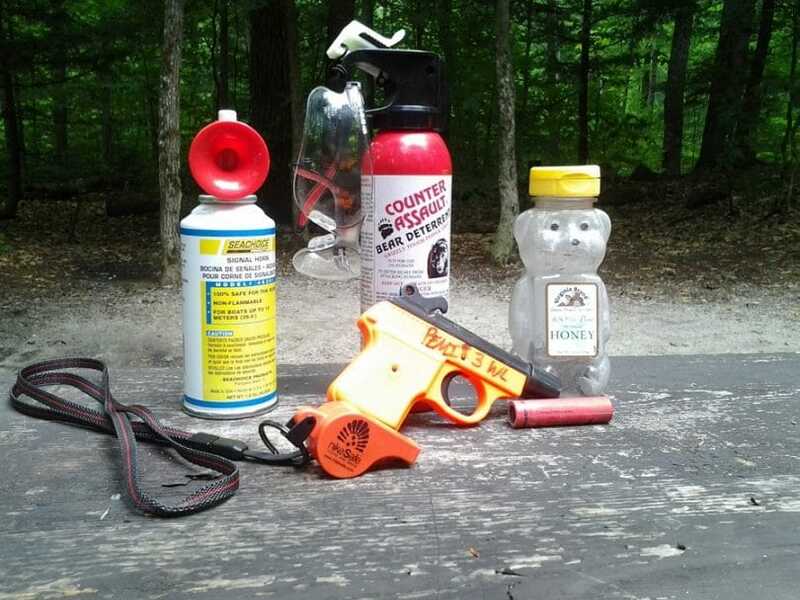 Having the best pepper spray could be the difference in how your bear encounter turns out. These pepper spray options are designed to help you get in and out of the woods the way you want to, without having to worry about the wild animals that you might come across along the way. However, finding the perfect spray can be stressful as there are numerous options available, and not all of them are effective. That’s why we’ve done the work for you by researching the best options and putting them together for you here. In this article, you will find the top options that we’ve found, but first you will get more familiar with the things you should look for when you’re looking for a new pepper spray. That way you can always keep yourself safe. But before that, take a look at the table to get a better idea which products we reviewed and what to expect. 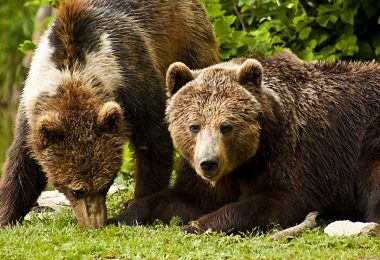 As you may have figured out, bear spray isn’t the same as an ordinary pepper spray, basically because you’re using it on bears, which are different than humans. So, if you want to increase your chances of staying safe from a bear attack, you want to look at these. Both ordinary pepper spray, as well as the bear spray, contains a substance called oleoresin capsicum. This is the substance that makes the attacker’s eyes tear up and it’s the same substance that makes cayenne peppers hot. As such, if a pepper spray says it only contains 30% oleoresin capsicum, it’s not actually a bear spray since it can’t stop a bear charging. In order to fully inhibit its respiration and eyesight, affecting his airways, lungs, and eyes, the percent of capsaicin and derivatives should be at least 1%, though it can go up to 2%, without much difference. Apart from the oleoresin capsicum that comes from the cayenne peppers and which makes the face, nose, and lungs burn when employed to deter an attack, there are other key ingredients that help the spray work, such as an oily fluid that dilutes the oleoresin capsicum, and an aerosol-based propellant which is used to thrust the spray out of the can. There are several different products out there that you may think are the same or similar. When you’re looking for a bear spray you want to know what you’re getting, however, and that means carefully reading the packaging to make sure the product is going to work the way you want it to work. First, you want the spray to specifically say it is for bears. 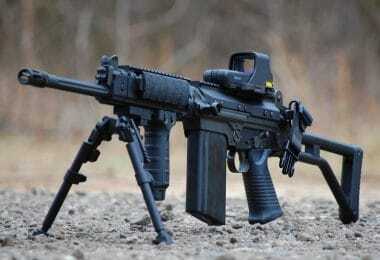 Second, you want to look at things like deterrent, repellent and stop the attack. These are going to tell you what the product is designed to do, so you can decide what type you really want or need for your next trip into the wilderness. Finally, look at whether the product is EPA approved to make sure you’re getting something that’s really designed to work and is large enough to help you. 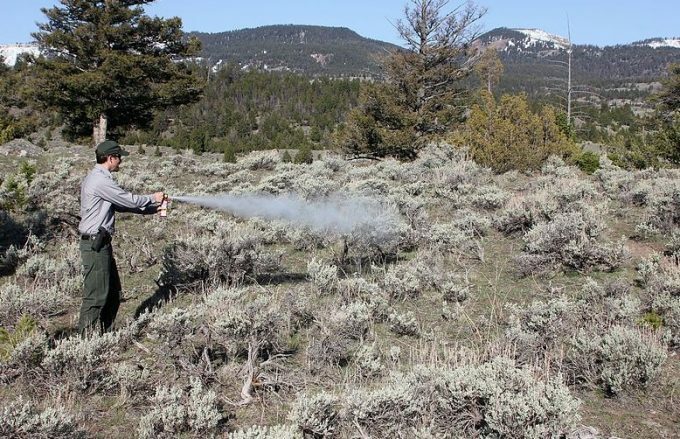 The EPA won’t register anything less than 7.9 ounces, and they require the product to have specific qualifications to be marketed as an approved bear spray. Once you’ve made sure the selected spray is indeed meant to prevent a bear attack, it’s important to look at the spray duration. This refers to the period of time during which you can spray the attacking bear. For instance, if this duration is 7 seconds, that means spray will only come out of the can for 7 seconds. So you should aim for more time if you want to hit the bear for longer periods. You also need to think about what it’s going to take to get that bear away from you. If the duration you have is too short the bear may not even be able to feel the effects before it reaches you. Think about when you stub your toe. How long does it take for the pain to register after you’ve done it? That’s how a bear is going to react to the spray you have as well. This indicator refers to the distance that the bear has to be from you, in order to be fully affected by the spray. The six EPA approved items in this category have a range of action between 18 feet to 40 feet. If you choose a bear spray with a bigger reach, you’ll probably feel and be more protected. If you’re not really sure about your ability to face the stress incurred by a charging 300 pound raging animal, a smaller reach is not such a good idea. On the other hand, the bigger the reach, the smaller the spray duration. Take that into account, because the bear will probably be moving very fast, and you don’t want to risk voiding your spray of its propellant attributes in the face and claws of danger. Although the EPA doesn’t approve bear spray cans below about 8 ounces, you should know that there are cans way bigger than that. You can get them as large as you want, which may seem like a great idea, until you consider the fact that it has to fit in your backpack and you have to be able to carry it. Make sure that you aren’t jumping into something too large and unwieldy that you won’t be able to use when it comes down to it or that you won’t be able to carry for an extended period in your pack. 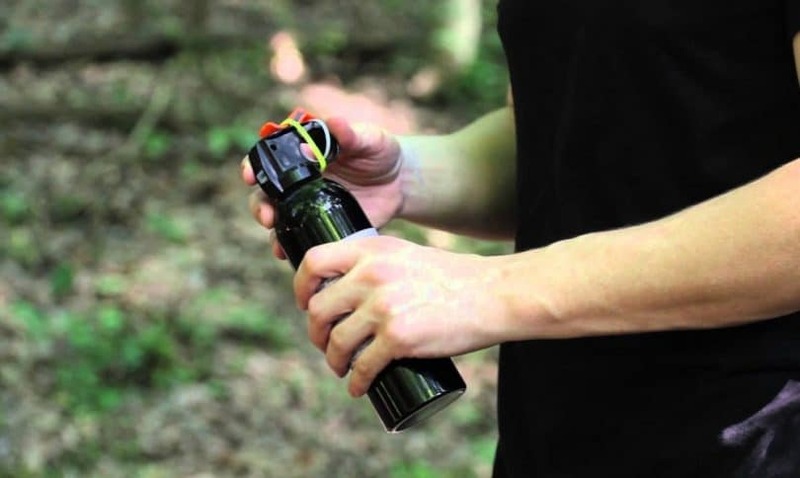 Once you have made sure how and why you should get a bear spray to feel more protected during your camping trip, let’s take a look at some of the top-shelf products in this department. 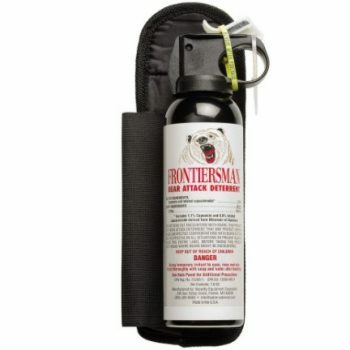 Description: The Frontiersman Bear Spray is a moderately sized option that will allow you to pack it and plenty of other things in your pack, which is important when you’re traveling for any length of time. Even better, it has a 30 feet range, which means you don’t have to let that bear get too close before you start spraying. Easy to hold with a belt or chest holster as well, this spray has 2% capsaicinoids (the max allowed by the EPA and Health Canada) so that it can easily deter that bear. It provides a heavy fog that means even if the bear isn’t close enough, it has to run through that fog to get to you, making sure it’s hit with the full effect. 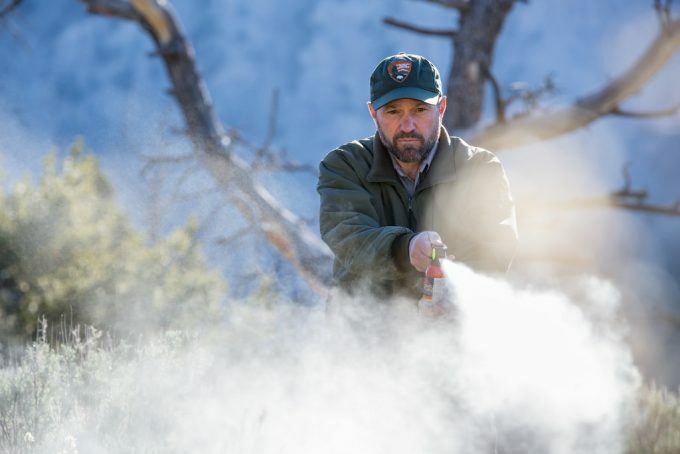 Field tested by the Elmendorf Air Force Base and the Brown Bear Resources, this spray has already been proven to work against black, brown and polar bears, so you can feel safe heading out into the woods, even in the dark. After all, this bear spray uses a glow-in-the-dark safety mechanism so you can always find it, even in the dark. Related: This Coghlans Bear Bell is great for keeping you from surprising a bear that’s just trying to go about its daily life. The bell sounds as you walk, which alerts any animals in the vicinity to your presence, allowing them to get out of the way before you get close so hopefully you’ll never need your bear spray. 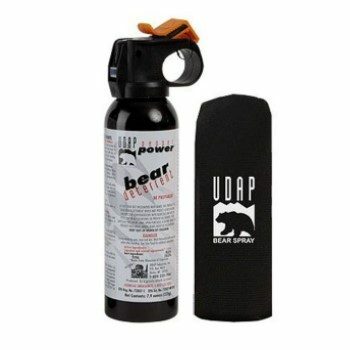 Description: The UDAP 12HP Bear Spray here comes with not only the spray itself, but a manual that tells you all about bear safety and how to keep yourself even better protected. That way, you may be able to avoid the bears in the first place, so you don’t ever need to use your bear spray. 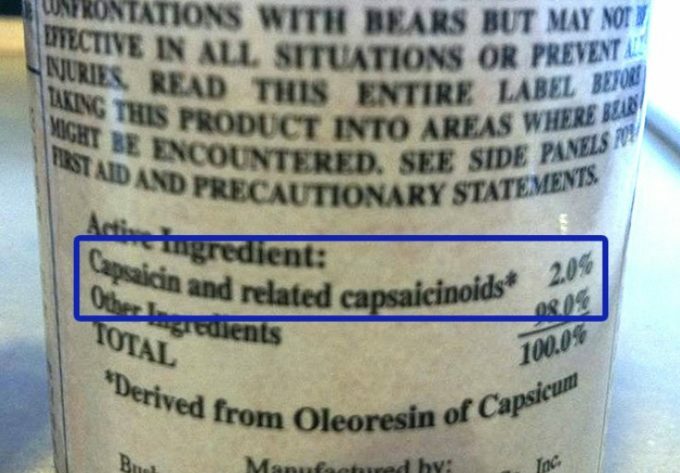 Made by a bear attack survivor, this spray features 2% capsaicinoids, which is the highest level allowed by the EPA and also provides you with a 30-foot range, so you don’t have to be too close. Lightweight and easy to use and carry, this bear spray is super strong and makes sure that you feel safe heading out into the wilderness or even against intruders. Whether you’re a hunter or just someone who likes to take long walks in the woods, you’ll have no problem with this stuff. The glow-in-the-dark clip also means you’ll be able to see it even in the dark. Related: Just because a bear is close doesn’t mean you need to spray it with a bear spray at all, at first. The Falcon Safety Super Sound Horn could be a good alternative that lets the bear know you’re nearby and may be able to scare it off before it starts to attack. 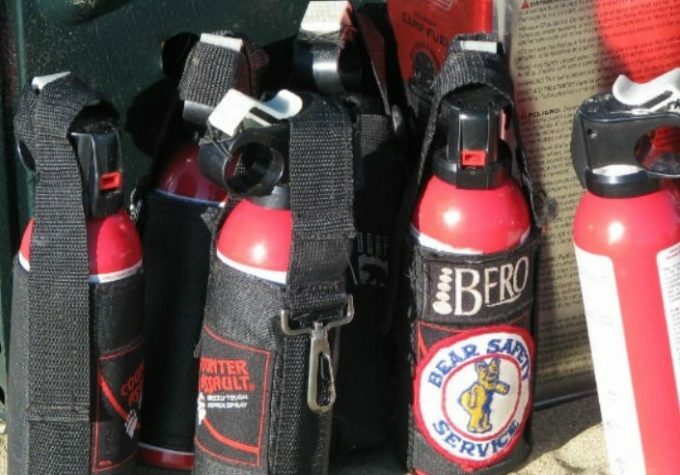 Description: This bear spray looks just like a fire extinguisher (only smaller) and it’s definitely going to provide you with some firepower. 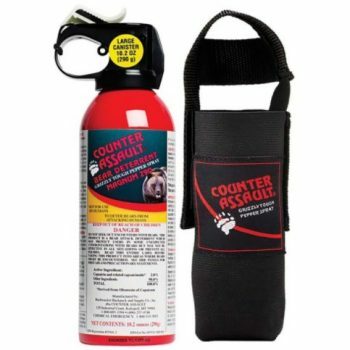 The Counter Assault Bear Deterrent provides about 9.2 seconds of spray time with up to 32 feet of reach, so you can definitely get anything coming at you. A safety cap over the top makes sure that you don’t accidentally discharge the unit and the system allows you to spray short bursts or one long stream of fog, so you have plenty available to practice before you ever need it. Designed with a holster that makes it even easier to carry, this canister is over 10 ounces, which means it has plenty more than most bear deterrents and sprays. The loop on the holster fits right over your belt and that means it’s right at hand but won’t get in the way while you’re hiking through the woods. Related: The Frontiersman Bear Bell can be a great option to carry with you as it sounds a small bell to alert animals (including bears) that you are coming. This can make sure that they head off in the opposite direction and you don’t have to ever use your bear spray. 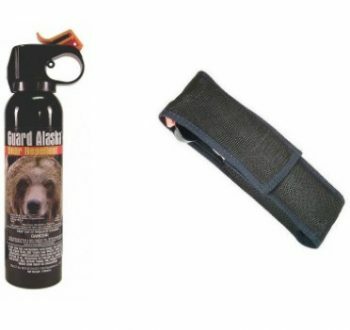 Description: The Guard Alaska Bear Defense Pepper Spray is completely eco-friendly and has a fogger system that makes sure any bear that’s attacking you is definitely going to have to run through that fog of spray. Rated up to 20 feet and with up to 9 seconds of spray, this is definitely something that’s going to keep you safer, no matter where you are and what you run into. Certified by the EPA for all types of bears, it has a 4 year shelf life and comes with a 30 day, money back guarantee. That means you’ll get a chance to check it out and test it to see if it’s really going to work for you before you decide if you want to risk your life with it. Slightly lower on the capsacinoid scale than some of our other options, this one still provides you with plenty to make that bear think about reversing direction. Related: If you’re going to be heading out into the wilderness with your bear spray you also want to make sure your stuff is protected from bears and that’s where this Bear Outdoor Tarpaulin Heavey comes into play. You can store anything you want in here and be ready for anything. Description: Okay, so this isn’t technically a pepper spray, but it is something that can help you if you find yourself staring at a charging bear. 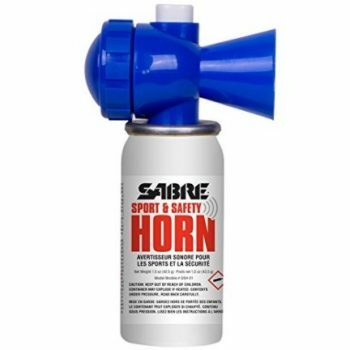 The Sabre Compact Sport & Safety Horn is a super loud alarm that you can hear up to ½ mile away, which means a bear is definitely going to hear it and they’re going to decide to turn around and head back in the opposite direction. At 115 dB, this is definitely something you’ll want to cover your ears for, but the bear won’t be able to do that. Plus, you can easily store it away in your pocket or bag so it’s ready when you need it. What’s even better is this loud alarm works for other things besides scaring off bears too, like alerting someone if you’re lost or injured. It can let out up to 50 ¼ second blasts or 25 ½ second blasts, so there’s always a way to alert others when you’re in danger. Related: In case your bear doesn’t decide to change course after this air horn, you can use the Tornado Bear Spray instead. This really gets bears to stop and turn around because it has a super strong release. Description: The Wildfire 18% Pepper Spray isn’t really designed to work just for bears, but it’s definitely going to work for you because it’s designed to get rid of just about anything. It has a Scoville Heat Index rating of 3 million, which means that any animal that gets too close, is going to smell that heat and be affected by it. The Wildfire Pepper Spray has a range of up to 18 feet and has an 18% concentration of oleoresin capsicum, which means it’s going to give off plenty of power. For those who don’t tend to go into the wilderness a lot, this is definitely something that you’ll want to check out and it just might be able to improve your overall safety for more than just bears. Furthermore, it is light enough to carry around with you anywhere, and small enough that it’s not going to interfere with your normal hikes; this is definitely something you’ll want to check out if you don’t frequently come into contact with bears or areas where they live. Related: You’re going to want a way to carry this system around with you and the NW Self Defense Holster is going to be a great option. It looks good, is made with nylon and has a stainless steel clip that makes sure you can hook it right to your belt. With the Wildfire Pepper spray, we have reached the end of our article. When it comes down to it, the most important thing is making sure that you have something on you, to protect you in case of a bear attack. You never want it to happen to you, but being prepared could save your life, and that of your family and friends. Carrying the right bear spray means making sure that you look at all of the information we’ve given you here and check out the sprays you’re thinking about, even if you decide not to go with one of the options we’ve chosen. There could be plenty more great ones out there. Just make sure you know what you’re doing when picking them. Do you have other tips for choosing a high quality pepper spray? 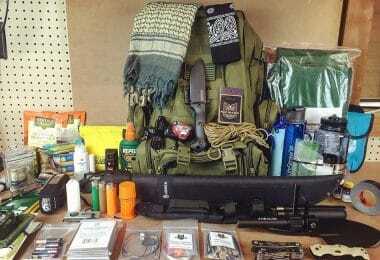 How about a different bear spray that you like best? Or maybe you’ve had an actual encounter using one of these sprays? We want to know all about it in the comments section.